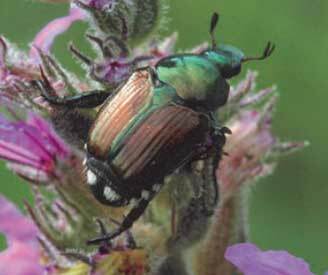 Scarab beetle, similar to a June beetle/June bug. One year lifecycle. Metallic green head and abdomen with brown elytra. Five white tufts similar to hair along the edges of elytra. About 12 mm long. 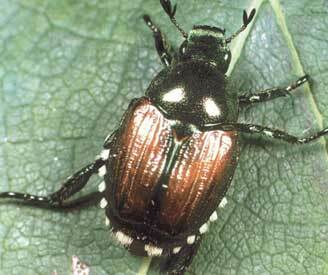 White grub larvae have gray abdomens and brown heads. Learn more here. 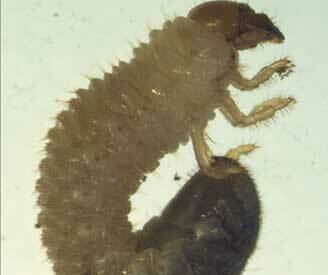 Larvae are found feeding on turf roots. Among the plants most commonly damaged are rose, grape, crabapple, and beans, but will feed on over 300 plant species. First found in New Jersey in 1916; originally from Japan. Spreads through the movement of infested nursery stock, as hitchhikers on vehicles or in cargo. 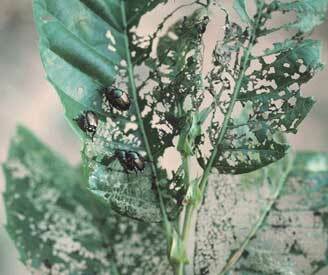 Skeletonized leaves and defoliation of host plants. Root damage to lawns caused by the larvae. Learn about control options Here. Positive traps found in several Nebraska counties across the state (2011). It is distributed throughout the U.S. (except the Southeast). Learn more on the USDA Animal and Plant Health Inspection Service website.